2 for 1 Pizza, 2 for 1 Donair, 2 for 1 Pasta! Check out our menu and order today. Welcome to Columbus Pizza & Donair! Delicious Pizza in Edmonton Anytime! Want great pizza, pasta, or donairs right now? Columbus Pizza & Donair is open whenever you’re hungry. We offer citywide delivery 24 hours a day, 7 days a week including holidays, so no matter what time of day it is, great food is just a call or a short drive away. 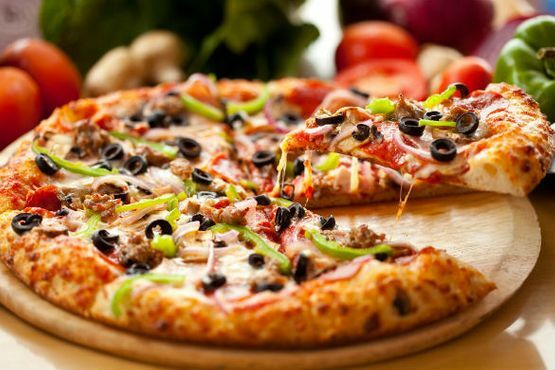 When it comes to delicious pizza in Edmonton, we’re your source for mouth-watering flavour, competitive prices, and convenient delivery. Our menu features two for one deals on pizza, pasta, and donairs, giving you savings the whole family can enjoy. Plus, we have lots of other tasty options like burgers, seafood, salads, soups, sandwiches, steaks, and desserts, so we’re sure to have something for every taste or craving. Our menu also includes kid’s meals, family combo options, and tons of promotions and special offers. We use only the best quality ingredients in our pizza and other menu items, with a variety of toppings for you to choose from like pepperoni, mushrooms, ham, pineapple, sausage, chicken, and more. With our multiple locations, donairs and tasty pizza in Edmonton are yours whenever you want. Whether you’re craving a late night snack during a quiet evening at home alone or hosting a party for 30 friends, our food is great for any occasion. Take some of the stress out of party planning and let us handle the food! We’re the home of the original party pizza, so you can order an 18” x 26” pizza for your next gathering with any 3 toppings you like. Among our many menu items, we’re proud to offer homemade donairs, a unique meat and sauce on pita dish invented in Nova Scotia. Whether you’re a donair aficionado or have never tried one before, we’re confident you’ll love the quality and flavour of our donairs. Read more about the birth of the donair and then try one yourself! Find out what our many repeat customers already know: Columbus Pizza & Donair is a perfect choice for fresh, hot, reasonably priced food any time of the day. Call us to order your Edmonton pizza, donair, or pasta today!